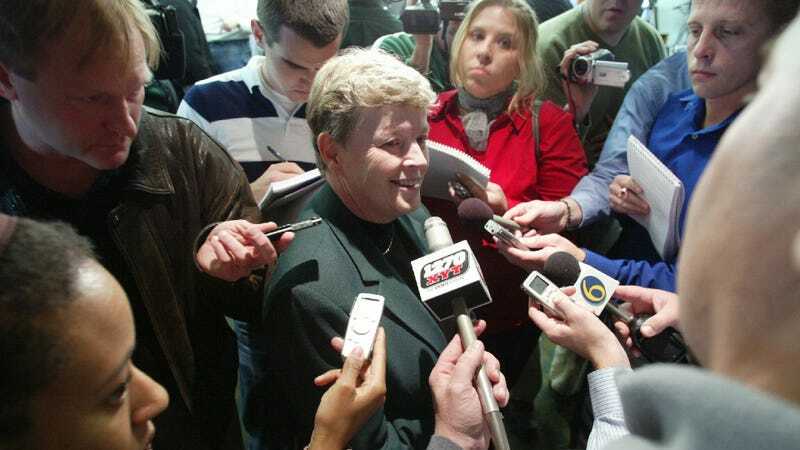 The Michigan State board of trustees gave Lou Anna Simon a vote of support Friday despite an overwhelming number of calls for the university president to resign or be fired amidst the dozens of victims testifying against Larry Nassar at the ongoing sentencing phase of his prosecution. Those same trustees, who gave Simon a $150,000 raise last month, acknowledged in a statement that the university was “perceived as tone-deaf, unresponsive and insensitive to the victims” but supported the president anyway even after the revelation that at least 14 MSU staffers and representatives—including Simon—knew about Nassar’s abuse beginning as early as 1992, and did nothing. Michigan State, for its part, claims its own investigators looked into the claims and found nothing. The number of women testifying about Nassar’s abuse at his sentencing has now grown to 120, and more than 150 women are parties to civil lawsuits that contend Michigan State is responsible for allowing Nassar’s reign of abuse to continue unabated. A number of political candidates and Michigan legislators, as well as the MSU student newspaper, have called for Simon to resign. Simon, who has helmed Michigan State since 2005, claims she is unable to answer questions about the university’s responsibility in enabling Nassar to abuse scores of women and girls over decades.